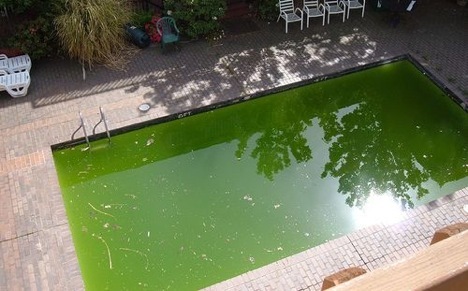 Here is a green swimming pool in Sacramento…. Not for long !!! Dynamic Pool Cleaning Service to the rescue. A swimming pool can be home for thousands of little creatures. Without proper chemicals, these creatures will multiply in your water, eventually creating the early forms of life! This life is what causes the pool to turn green, and eventually black. If you let this stagnant water sit too long then you will no doubt cause staining. Bottom line: our services are cheap and quick. Pick a pool cleaning service that is best for you and no doubt we will have you back to blue in a matter of days, and swimming by the weekend. Does your pool have green spots, maybe black algae spots? Do you see green “crud” building up in places that it should not? This happens because home owners may only purchase “residential grade” chemicals to kill “commercial grade” problems. When you have found that the “Water Testing Shop” is more interested in selling you chemicals you do not need, try a “Solution Shop”: Dynamic Services! The cost of Green Treatment Service is often less than doing the service your self..
Oh no! Not A Green Pool! If you have left your pool “unattended” for a few weeks and you can see the shallow-end of the pool but not the deep-end, then this service is for you. This is a two-time, commercial grade “power through” service. We will first flush your lines of build up, chemically treat your pool water for clarity and sanitation, vacuum the bottom, and clean your filter. But most importantly, we will run through your pool water and equipment pad to make sure you don’t have any lurking issues. We will also give you a written estimate of any recommended repairs. Remember pools do not just wake up one day on the wrong side of the neighborhood, they develop issues that when left unattended for weeks will cause your swimming pool to turn green. Let us clean it up, and get the issues gone. Dirty Pool? Do you have a dusty bottom, leaves all over, or even “animal” accidents? I can clean them in no time, with a chemical treatment and a simple vacuum service. Does your pool need a vacuum service but your filter is not working or distressed or too small to handle the amount of debris at the bottom of your pool ? Do you have a dusty bottom, leaves all over, or even major “polar bear” accidents? We recommend our vacuum to waste service to literally vacuum and remove that debris out of the bottom of your pool to your drainage system, with little to no residue left in your pool bottom. That means you can take your complicated vacuum service and hit control alt delete to call us for our simple vacuum to waste service solution.